Learn more about No Conventional Miss as Paul and Rilla clash as they adjust to marriage. “They came earlier. I directed them to change horses and proceed to London as we’re leaving tomorrow.’ Paul sipped his wine. ‘We are? But we were supposed to stay a week.’ Rilla laid down the massive fork with a clatter. Anger blossomed, although it was less about his autocracy and more about that tiny unacceptable frisson of relief. ‘Because…’ Her stomach lurched. The incident sprang huge between them. His admission made her angrier. She balled her hands to fists. Her jaw tightened. ‘My health is robust. Besides, my parents discussed—’ She stopped. Her parents spoke about everything—village doings, their children, their hopes and dreams. But this was no such union. ‘We are not your parents.’ His voice, though soft, cut. They continued eating in an uncomfortable silence, broken only by the clinking of knives and forks. Irritation at him and at her own vulnerable relief tangled in Rilla’s mind. She wanted to leave this place. Yet his choice to do so perversely annoyed. Edison refilled their glasses, cleared the plates and served a sweet, fluffy concoction for their pudding. Then he left and silence again enclosed them. ‘I think I will retire and leave you to your port,’ Rilla said at last, rising from her chair. “She nodded. He offered her his arm and she placed her hand on his sleeve, conscious of taut muscles under the cloth and the smell his cologne. They moved towards the door, stopping at its threshold and she was suddenly aware of their solitude, of the warmth of his breath and the height and strength of him. He fastened his gaze on hers, placing his hand against her cheek. She tingled at this touch. Her anger dwindled, turning into something else. She bit her lip. His breath quickened. With a quick, almost violent movement, he possessed her mouth with heat and power and need. ‘Perhaps you are too ruled by restraint,’ she said softly. She flinched at the words. Was it always to be thus—this guarding of words and actions? This fear of sentiment? ‘Rather that than to be a statue,’ she retorted. As she left, she glanced back. Paul stood by the fireplace. He gripped the mantel with both hands, his head bowed low, a solitary figure. I’m so excited to share with you this great development from Google Play. Google Play has launched a dedicated page to Mills & Boon upcoming releases. Never miss a new release from your favorite Mills & Boon authors! The downside: this page is only available in the UK. So check it out UK readers, and find your next favorite love story. As a writer, I am also a voracious reader, and I know what it’s like to fall in love with an author only to run straight through all her books and be left with nothing. Heartbreaking, isn’t it? Truly, how many times can you pray and wish that the author would just hurry up and write the next book? Should you ever find yourself in a Regency romance hole, here are some resources to explore to find either the next book of your dreams or more facts and secrets of the Regency world you love. The Regency Reader: books, history, passion. The Regency Redingote: everything you didn’t know you wanted to know about the Regency period. Historical Romance Writers: where there are writers, there are books to be read. Romantic Historical Reviews: excellent reviews of the books that should be in your TBR pile. No Conventional Miss received a glowing review from Eileen at Booktalk with Eileen. View the entire review on her blog here. I’m so excited to be participating in the TRS Thanksgiving holiday party! Be sure to stop by to check out fun posts, discover new authors, and enter for a chance to win some great giveaways! 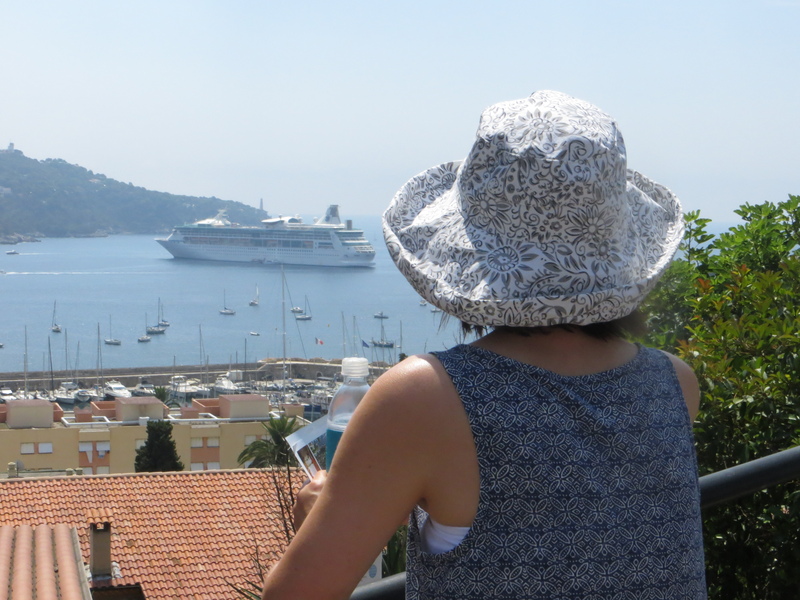 As I stood on deck, my Paddington hat (see earlier blog post) pulled firmly about my ears, I thought about history, holidays and, more specifically, the heroine in my latest novel, No Conventional Miss. I was on a European cruise and I realized it was timely that this cruise should occur in the same year as my Regency debut. Continental travel, in the form of the European Grand Tour is, after all, steeped in history and tradition. Indeed, while no Regency hero would travel on anything resembling a modern cruise ship, there are similarities. Firstly, itinerary – we were in Europe, after all. The Grand Tour would usually start in Paris before going to Switzerland and then southward to Turin, Florence, Venice, Rome, Naples and the archeological sites of Herculaneum and Pompeii. Okay, my own itinerary did not include Paris which was an absolute ‘must’ for any Grand Tour but most of the other ports of call were included. Secondly, purpose – the European tour was not purely for entertainment. It aimed to increase knowledge. Indeed, so serious was this intent, that a tutor or ‘bear-leader’ would form a part of the party. Our cruise did not have a ‘bear-leader’. Truthfully, I had never heard the term before researching this post, but we had a travel advisor with fascinating power-point presentations – does that count? Besides I had to look at my own motivation. This cruise was, in part, a graduation present for my eldest daughter and I recognized that while sun-tanning and shopping might be first on her agenda, I sought something else. In Regency times, a European Grand Tour aimed to increase sophistication and thus prepare the individual for leadership. While my 18 year old is quite sophisticated enough (believe me! ), I acknowledged a similarity of purpose. I had chosen Europe for a reason. It was not for the food, the hot tubs or swimming pools – delightful as these were – or even the Prada shoe store. And anyone who knows me, knows I love shoes. No, I wanted this trip to provide my daughter with a brush with culture, an opportunity to see Roman aqueducts, to step into buildings more than a thousand years old and to discover a world, so much older than our own country of Canada. There is an allure, an enchantment surrounding the antiquities which bridges the centuries. Paul and Rilla in No Conventional Miss share this fascination. And while Rilla, as a female, would be unlikely to partake in much European travel until later in the 1700s, Paul had traversed the continent. Indeed, his travels were quite similar to my own and while he would not have donned swim trunks or competed in a belly flop competition – would any Regency gentleman!?! – he would have marveled at Pompeii’s ruins. He would have stepped into the solemn silence of the Sistine Chapel and admired Michel Angelo’s David. There is, it appears, a common need to connect with our forebears, to learn from the Ancients and to feel a continuity and connection with the very best of human endeavors. Perhaps that is why I love and write historical fiction. It explores emotions and reactions to those whose experiences differ from our own and yet are invested with so many similarities. Because the human experience, from whatever period, is one of joy and grief, of excitement and pain. It demonstrates that which is the very best and the very worst within our nature. And it is always fascinating. • Keep an eye on this space for notes from my European travel! And so, as we stopped at each place, I monitored my own reactions and wondered how my hero and heroine might have reacted, what they would have seen and whether things were better…worse…the same. And I celebrated that continued curiosity which represents the very best of the human experience. The British made this tour most popular during the 17th and 18th centuries and it usually began in Dover. Unlike my own cruise, young gentleman, as opposed to women, would be the most likely travellers – at least until the advent of the railway. Somewhat similar to Facebook or my own blog for that matter. These impressions of Rome were noted down by Johann Wolfgang von Goethe in 1786. His “Italian Journey” (published in 1816-1817) abounds in inspired reflections of the city’s architectural and artistic treasures. Throughout the 18th and 19th centuries, Rome excited similar interest of countless travelers from across Europe, many of whom left invaluable visual and written records of their journeys. However, it is not difficult to imagine such thoughts as Goethe’s being written down by a contemporary traveler to Rome. To this day, the seat of Europe’s ancient Classical heritage has continued to invoke widespread awe and delight. A desire to see firsthand the finest specimens of art and architecture documented by 18th- and 19th-century Grand Tourists has led the members of the research team Ana Šverko, Ivica Čović, Irena Kraševac, and Iva Raič Stojanović to undertake a tour of their own and visit the Eternal City. The architect Charles Robert Cockerell (1788-1863) was encouraged to travel at a young age, so that he might draw inspiration from the great works of European architecture. However, when the Napoleonic Wars made parts of the continent inaccessible to Englishmen, his eye was turned towards southern Europe and the Ottoman Empire. This version of the Grand Tour took up seven years, during which he recorded the events in his journals. There his observations would have remained had it not been for the editorial labours of his son, Samuel Pepys Cockerell (1844-1921), who published the present work in 1903. The narrative takes in such cities as Constantinople, Athens, Florence and Rome. Touching also on friendships made with such figures as Byron, the text gives a sense of what continental travel was like at that time and how the architecture of the past continued to captivate designers in the modern age. The typical 18th-century sentiment was that of the studious observer traveling through foreign lands reporting his findings on human nature for those unfortunate enough to have stayed home. Recounting one’s observations to society at large to increase its welfare was considered an obligation; the Grand Tour flourished in this mindset. The Grand Tour not only provided a liberal education but allowed those who could afford it the opportunity to buy things otherwise unavailable at home, and it thus increased participants’ prestige and standing. Grand Tourists would return with crates of art, books, pictures, sculpture, and items of culture, which would be displayed in libraries, cabinets, gardens, and drawing rooms, as well as the galleries built purposely for their display; The Grand Tour became a symbol of wealth and freedom. Artists who especially thrived on Grand Tourists included Carlo Maratti, who was first patronized by John Evelyn as early as 1645, Pompeo Batoni the portraitist, and the vedutisti such as Canaletto, Pannini and Guardi. The less well-off could return with an album of Piranesi etchings. After the arrival of steam-powered transportation, around 1825, the Grand Tour custom continued, but it was of a qualitative difference — cheaper to undertake, safer, easier, open to anyone. During much of the 19th century, most educated young men of privilege undertook the Grand Tour. Germany and Switzerland came to be included in a more broadly defined circuit. Later, it became fashionable for young women as well; a trip to Italy, with a spinster aunt as chaperon, was part of the upper-class woman’s education, as in E. M. Forster‘s novel A Room with a View. However, perhaps the most famous Florentine love story, without any doubts, belongs to Francesco I dei Medici and Bianca Cappello. Bianca was the descendant of a famous Venetian family. In 1563 she fell in love with Florentine Pietro Bonaventura, ran away with him to Florence and soon got married. But during a reception, Bianca met Francesco de ‘Medici and these two young people fell in love with each other at first sight. Although Francesco already had wife Giovanna, this did not prevent him from relationship with Bianca. Soon Giovanna died in mysterious circumstances, so the lovers did not have to hide any more. Finally, they got married and Bianca became wife of the Grand Duke of Tuscany. After eight happy years, during their rest in Poggio a Caiano country villa, one evening they suddenly felt bad and having a temperature. Francesco I died 10 days later, Bianca passed away on the 11th. Over the years, many people were in search for the answer, what happened to the most famous Florentine couple, but the version of poisoning with arsenic is not confirmed yet.